A big Thank You to four Florida plaintiffs and their legal team (Attorney Nancy Wright, Disability Rights Florida, and Southern Legal Counsel) for negotiating a Settlement Agreement benefiting enrollees in the Home and Community Based Services (HCBS) of Florida’s Long Term Care (LTC) Managed Care Program. The plaintiff’s primary complaint was that the Agency for Health Care Administration (AHCA) implementation and oversight of the HCBS program left them at risk of unnecessary institutionalization. While AHCA denies the program has been mismanaged, the parties agreed AHCA will provide an array of home and community-based services that enable enrollees to live in the community and avoid institutionalization. Effective April 23, 2017 Florida Administrative Code 59G-4.192 provides Medicaid’s SMMC LTC Program Coverage Policy. 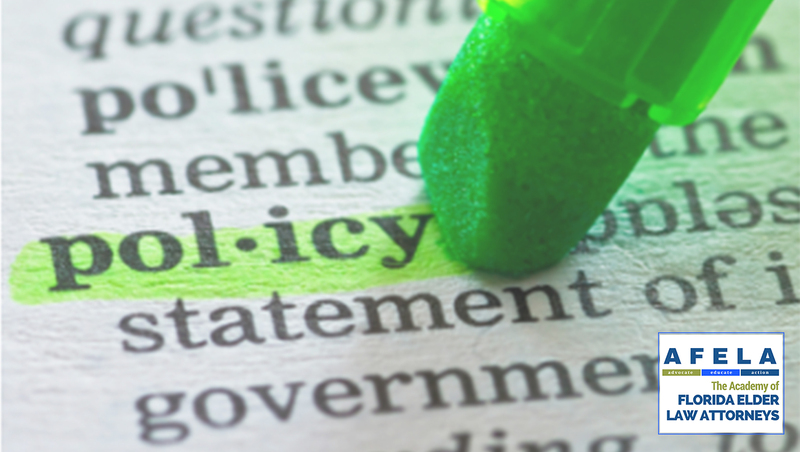 The policy outlines the responsibility of the managed care companies to enrollees and new procedures they must implement. It specifically outlines the assessments and tools each managed care company must utilize as well as defining health care providers and services the managed care company may use to provide services. All Florida LTC managed care plans are required to provide an array of home and community-based services that enable enrollees to live in the community and to avoid institutionalization. The managed LTC plans must provide services consistent with each enrollee’s plan of care and their goals and allow the enrollee to reside in the most appropriate and least restrictive setting. All services must be documented on an individualized plan of care based upon a comprehensive needs assessment. Each enrollee (and/or their legal representative) must meet with the case manager of the managed LTC company they select. The case manager must complete a full assessment, including assessing any caregivers involved in the enrollee’s care and develop a care plan supporting the enrollee’s goals and that the plan supports their living arrangement. The enrollee’s individual care plan must be completed within 60 days of enrollment into a managed care plan. All individual care plans must be reviewed every 90 days. The care plan process provides the opportunity to advocate for the enrollee and ensure all available services are considered to enable the enrollee to live in the least restrictive setting. The goal is to avoid nursing home placement with the use of home and community services. Complaints to a managed LTC plan must be resolved within one day or they now become a grievance. Each LTC plan must provide information to enrollee’s regarding their grievance procedure and adverse benefit determination procedure. Enrollee’s may also file a complaint on the AHCA website, all complaints must be reviewed weekly. The Settlement Agreement requires AHCA to survey enrollee’s and develop an annual report on the Quality of Service and Gaps in Performance. Medicaid Fair Hearings related to LTC plans are now conducted by AHCA (instead of DCF). DCF will still conduct hearings regarding financial eligibility and other issues. All Fair Hearing notices will tell you where to file your Fair Hearing. More information is available on the AHCA website, under the Medicaid tab.